← Why the big four aren’t right for transformation. This article was originally published on B&T. Digital is now firmly ensconced into Australian organisations. According to research, 98 per cent of business leaders believe it is important to their organisation’s success. So, why are so many Australian companies struggling to leverage the power of digital and get real business value from it? After spending the last six months researching the internal elements to digital success inside 168 Australian organisations across a wide range of industries, I have some of the answers. The Australian Company Digital Confidence Report uncovered that there is a massive lack of digital confidence in Australian companies, and this directly impacts business results. It also found that there are four key components of digital confidence: leadership, vision, resources and skills. But in order to build digital confidence and experience the business results digital promises, a mindset shift needs to take place first. Although most CEOs know digital is important, they currently have a misconception about the role that digital plays in their company. They see digital as a sidekick, like Robin is to Batman. But for organisations to be successful, digital can no longer be seen as the often forgotten but trusty sidekick that comes in at the last minute to help Batman save the day. Digital can no longer be an afterthought. It needs to be front and centre. It needs to be an integral part of the success strategy from the start. Organisations need to start seeing digital as the vehicle that drives Batman towards achieving his heroic outcomes. The research showed that in successful organisations, digital is the Batmobile. And if digital is the Batmobile, then the CEO is Batman – the voice of digital, sitting behind the wheel. He is the leader that articulates what digital means for the company and drives that vehicle with confidence towards achieving the organisational goals. But this is only the case in one of five Australian companies. The other 80 per cent of businesses are lacking that strong digital leader, and as a result, digital is siloed off from the rest of the organisation, implementing non-strategic tactics and acting as a sidekick when it can be so much more. Digital is still Robin in most companies in Australia, and it is impacting business results. Changing the way you think about the role that digital plays in an organisation is a mindset shift, and the first step to experiencing real business results through digital. Digital needs to be seen as a key strategic foundation to achieving organisational objectives. 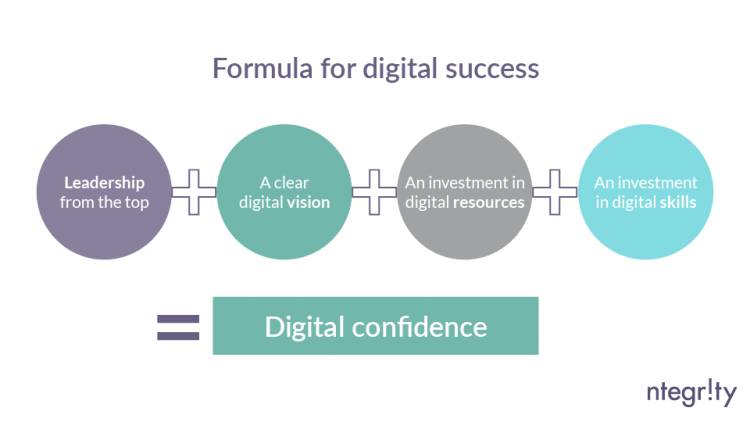 Getting this cultural change right up front, gives you the vehicle to build digital confidence through aligning the four pillars of digital success; vision, leadership, resources and skills. Without it, your Batmobile is out of fuel and reaching your destination will be a real struggle.